ORTELIUS - Asiae nova descriptio. ORTELIUS, A. - Asiae nova descriptio. Asiae nova descriptio. - ORTELIUS, A. Title : Asiae nova descriptio.. Date : Antwerp, 1575 - 1575. Size : 14.6 x 19.1 inches. / 37.0 x 48.5 cm. 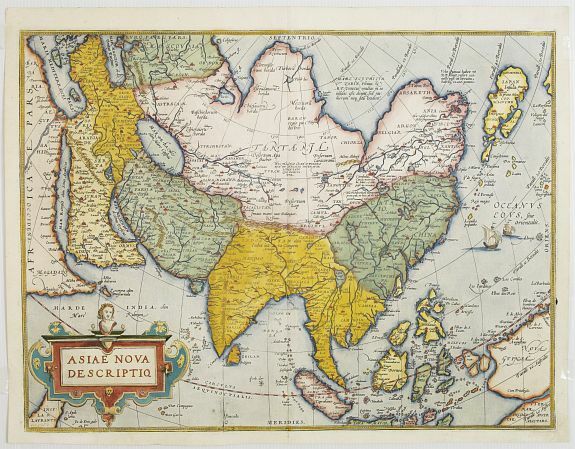 Description :The much rarer first plate of Ortelius' fine map of Asia. The first plate has "La Farfana", in the lower right corner. It is estimated that only 1575 copies are printed from this first plate. The map represents the continent at a time when Europeans were expanding their power in the Far East. The Indian subcontinent and Malaysian peninsula are easily recognizable. Ceylon and Sumatra are correctly placed, though their shape leaves something to be desired. The Philippines are distorted and Japan is too far north and incorrectly orientated, with the embryonic outline of the three main islands and with the Ryukus and Taiwan appearing as a tail of islands to the south of the archipelago. Cortazzi, plate 19: OAG, plate 10c: Broecke, Ortelius 7. Condition : Split of 5 cm lower part centerfold.